'Al-Qaeda 7' Controversy: Detainees And Politics Justice Department attorneys who once helped represent terrorism detainees are at the center of a raging dispute. Conservatives say that the politically appointed lawyers are influencing U.S. policy to help their former clients. Justice Department attorneys who once helped represent terrorism detainees are at the center of a raging dispute. A conservative group is arguing the nine lawyers are influencing U.S. policy to help their former clients. The seed of the controversy was planted at a Senate Judiciary Committee hearing last November, where Attorney General Eric Holder was asked about his agency's decision to give detainees civilian trials in the United States. "Would you provide me and members of the committee with the following information," Sen. Chuck Grassley (R-IA) asked Holder, "the names of political appointees in your department who represent detainees or who worked for organizations advocating on their behalf." Holder said he would look into it and added that people who have been involved in detainee issues recuse themselves at the Justice Department when it's appropriate. Holder continued, "People who should not be participating in certain decisions do not do so." Grassley and other Republicans sent a follow-up letter. And last month, the Justice Department responded, saying nine Justice attorneys were once involved in representing detainees. Grassley named two of them. A group led by conservatives Liz Cheney and Bill Kristol then released an Internet video spot. "Who are these government officials?" says a voice in the ad. "Eric Holder will only name two. Why the secrecy behind the other seven? Whose values do they share? 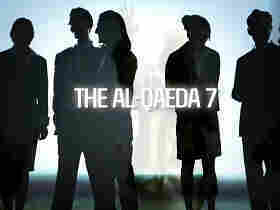 Tell Eric Holder, Americans have a right to know the identity of the 'Al-Qaeda 7.' "
Fox News identified the seven lawyers and pointed out that the Bush Justice Department also hired lawyers who had represented detainees. This week, nine former Bush administration officials released a statement calling the ad "shameful." They also said that "such attacks undermine the justice system." And Wednesday, the country's former top prosecutor added his voice, in a Wall Street Journal opinion piece. Michael Mukasey, attorney general from 2007 to 2009, wrote that it is "shoddy and dangerous" to automatically attack lawyers for the people they represent. He described his views in a phone interview. "The risk is that lawyers as a general matter will look first before representing clients who need representation and will avoid getting involved in any sort of controversy — in particular, lawyers who want to have a public career," Mukasey said. "And I think that that will carve out a large number of intelligent, capable people, and all you'll get is people who've devoted their careers to avoiding risk, and we don't want that," he said. Some conservatives have defended the ad. One of them is former Bush speechwriter Mark Thiessen, who wrote a Washington Post opinion piece this week that he described on Fox. "These are legitimate questions," Thiessen said. "If you'd heard that mob lawyers had been hired in the Justice Department to handle mob cases, or drug cartel lawyers had been hired to do drug cases, wouldn't you want to know who they were and what they'd been working on?" Lawyers who still represent detainees see some irony in this whole debate. They have been complaining for a year that attorneys who used to be their allies entered the Obama Justice Department and started making arguments identical to those made by Bush administration lawyers. For example, Neal Katyal won a Supreme Court case on behalf of Guantanamo detainees. Then Katyal went to work for the Justice Department — and detainees' lawyers were aghast at the legal positions he took. "If Neal Katyal is supposed to be representing the interests of al-Qaida from inside the Justice Department, he's doing a really awful job of it," said Jameel Jaffer, who runs the ACLU's National Security Project. "What Neal Katyal has been arguing is that prisoners held at, for example, Bagram Air Base in Afghanistan shouldn't be allowed to challenge their detention in court. He's been arguing for the continued detention of people held at Guantanamo. So in my view, he's an unlikely candidate for the Al-Qaeda 7." The Justice Department says that in this case, politics have overtaken facts and reality. In a statement, an agency spokesperson said, "We will not participate in an attempt to drag people's names through the mud for political purposes."